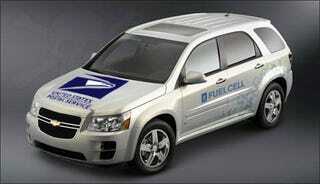 GM is partnering with the US Postal Service to place its fuel cell-powered Chevy Equinox into service in Irvine, California and other yet-to-be-identified locations. The idea is to put the fuel cell SUVs into heavy-use situations to help work out the development kinks. Not only that, but they'll be able to test the operation of the hydrogen filling station at UC Irvine. It's a cunning plan, and it makes sense, but they aren't getting one over on us.